Many of us call Thomas one of our favourite gospel people! He was a man who did not ‘mess about’ with his faith. He found faith in the risen Lord hard to take and let others know. He had often been a bit doubtful earlier – his solution to the prophecy of Jesus;’ death was that he should to go and die and get it done with! I like him too because he did not get it right always! While his doubting is understandable, he also messed things up. He thought he could go it alone! He left the group and so missed the appearance of the risen Lord. A central theme of our faith is community; our faith, while deeply personal, is not private. We worship together and celebrate our Christian feasts together as we have gathered together for the vigil and the Eucharist at Easter. Without the shared faith of family, parish, friends, and others, our Christ remains dry and historic. He messed it up in another way – he looked for touchable proof. He would not only sense the wounds of Christ but would touch them. Jesus took him at his word and said, ‘touch my wounds, Thomas’. 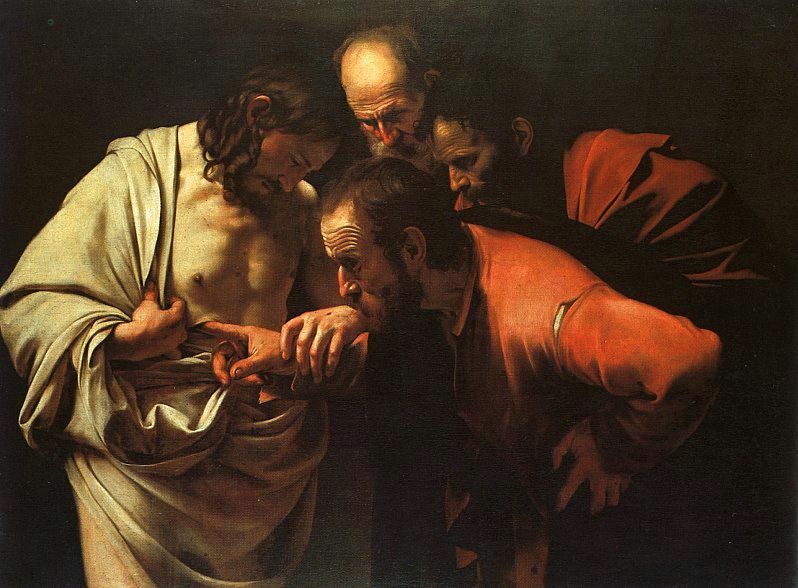 Nowhere in the gospel of today does it say Thomas did in fact touch Jesus’ wounds. Our faith in Jesus is deeper than touch and all he said on meeting the Lord was, ‘my Lord and my God’. Our faith, our doubts and our hopes can be put in perspective by Thomas. Launch: in Knock Shrine bookshop, Saturday April 14th at 4pm by the authors. This entry was posted in Gospel of John, Gospel of Matthew, Gospel Reflection, Liturgy Resources, Prayer Resources, Scripture, Year B and tagged Donal Neary SJ, gifts, Gospel Reflection, Jesus, John 20:19-31, Sunday Gospel Reading and Reflection.